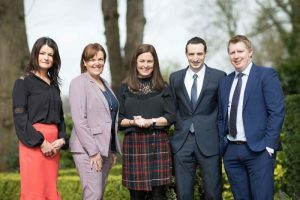 Performance psychologist Caroline Currid (2nd left) is pictured at Dromoland Castle Hotel with (from left); Helen Downes, CEO, Shannon Chamber, Patrick Jordan, executive chairman, Atlantic Aviation Group; Mary Considine, president, Shannon Chamber; and Shane O’Neill, CEO, Atlantic Aviation Group. Photo: Eamon Ward. 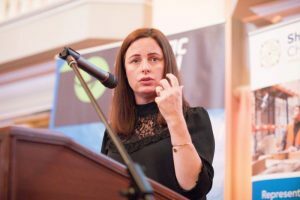 Often described as the unseen hand of multiple sporting victories, performance psychologist Caroline Currid delved into her vast array of experiences and successes to enlighten a roomful of business executives how to encourage and attain optimal team performance when she addressed a Shannon Chamber luncheon in Dromoland last week. Attendees at the lunch, which was sponsored by Atlantic Aviation Group and supported by Laya Healthcare and Shannon Chamber Skillnet, were given a masterclass in how to embed a high-performing culture within their organisations through empowering teams and individual to their fullest potential. Citing the huge co-relation between business and sport, Currid outlined how, through picking a case study each year, she finds nuggets of new information on high performance which enables her to keep her approach fresh and relevant. “There is no secret to high performance,” she stated. Stating that many high achievers and performers make huge sacrifices to attain their goals, she said the secret to success lies in prioritising what you want to achieve, allowing yourself to decide how far you want to push yourself and then pushing yourself in each element of attaining that goal. Commenting on the take-aways from the luncheon presentation, Shannon Chamber chief executive Helen Downes stated: “It’s clearly obvious why Caroline has become one of the most sought-after experts in performance psychology and why the results she has achieved while working with sporting organisations have set her apart from others in her field of experience. “While high performance may not be rocket science, its attainment lies in how teams are led and encouraged to contribute and perform. What we now know is that its attainment lies in doing the simple things very efficiently, having strategies and processes in place, measuring attainments, setting standards, allowing honest communication to foster a culture of self-worth and, valuing people,” Ms Downes added. 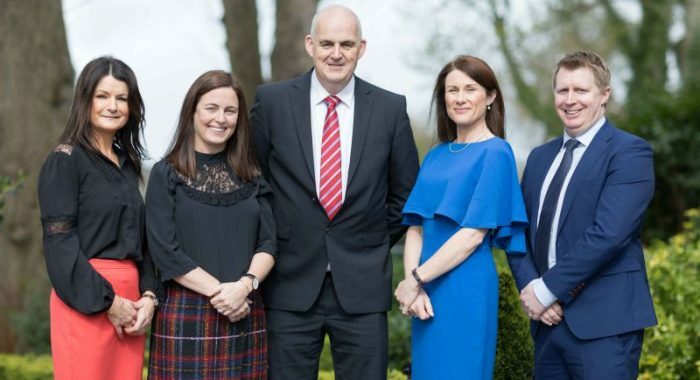 The Shannon Chamber lunch sponsored by Atlantic Aviation Group and supported by Laya Healthcare and Shannon Chamber Skillnet was held in Dromoland Castle Hotel. Caroline Currid (centre) pictured with (from left):Helen Downes, CEO, Shannon Chamber; Mary Ann Flavin, Laya Healthcare; Cillian Griffey, Shannon Chamber Skillnet and Shane O’Neill, CEO, Atlantic Aviation Group (AAG) The luncheon, held in Dromoland Castle Hotel, was supported by AAG (anchor sponsor), Laya Healthcare and Shannon Chamber Skillnet (associate sponsors).